January 28, 2019: From Oscar red carpets to the Golden Globes, it is the bring-back of the metallic glamour. While subtlety was having its run on the fashion scene, the golds’ and the sparkles were busy reinventing, rediscovering and shining their light on the Atelier’s imagination. 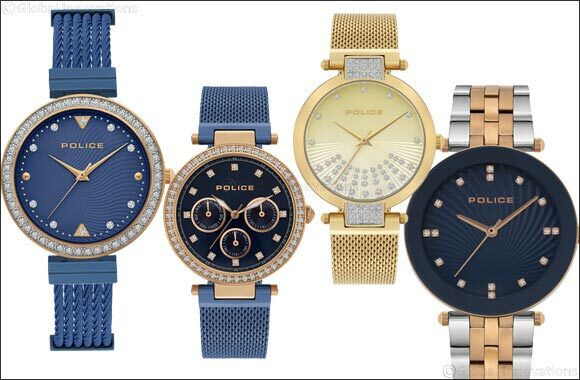 Debuting a new edition of decadence, the new collection of Police ladies timepieces screams “go big or go home”. Beautiful accessories render their easy charm to the timepiece, making a collection that comfortably finds the balance between daily fashion and chic evening charm. Cocktail watches are the highlight of this season— festive and festooned with sparkling stones, the timepieces are also available in functional chronographic versions as well as colored metallic bracelets. The collection starts at AED 800 and is available at Police kiosks and select luxury outlets across the Middle East.